Daffodil Bobbie I substituted the charm and backstitched the hat brim with the darkest pink shade rather than 801 brown. Stitched on 32 count mint green linen. Keeping the Eggs Dry WilmaBC Designed for Kreinik. 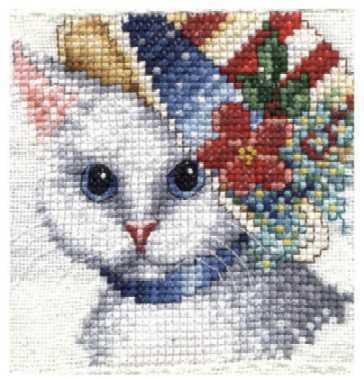 I stitched this on 28ct evenweave, using all DMC, and added a little bf to the raindrops to make them sparkle. Little Green Sampler Georgia I dyed some white fabric using green and blue food colouring and I turned my creation into a needleroll. Patrick Bobbie I stitched this one on 32 count mint green linen and substituted the #8 braid for #4 in 002HL and used a Celtic cross charm instead of the called for silver shamrock. 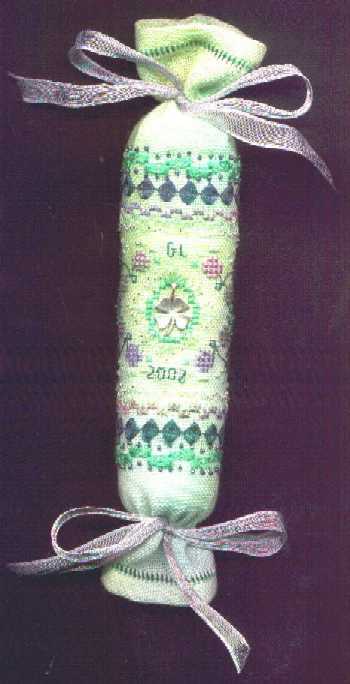 Samantha dlynell Used for an afghan square. I had to trim her a bit to fit. I also changed some of the colours. 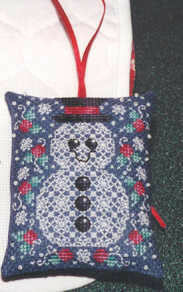 Snowman Cindy Stitched on Moon Princess evenweave (from Sugar Maple).